There are driving test centres located all over Birmingham. Your instructor will let you know which one is most suitable for you. Take your instructor’s advice about booking to make sure they’re available on the day. This will usually require a 2-hour booking to allow time for a warm-up driving lesson, the test itself and the journey home. The cost of the Practical Test for car drivers is £62.00 during weekdays or £75.00 for Saturday and weekday evening tests. You will need to print off your test details as this is no longer posted out to you.If you don't have a printer available then make a note of your reference number. If you need to cancel your test for any reason, you’ll have to give three working days notice to keep your fee. DSA test fees are subject to changes. You can book your driving test on line or by phone with the DSA. No you can’t!!! You must take your provisional driving licence and your Theory Test pass certificate with you when you arrive to do the Practical Driving test. If you have a photo-licence you must take the counterpart with you as well. It is part of the licence. You must have some form of photographic identification and all the documents must be original, not photocopies. For more information or to book a course of driving lessons give us a call or use our contact page. To pass your driving test you need to read a number plate from 20 metres, answer 2 questions about the car, drive without making any serious or dangerous faults and no more than 15 minor faults during a drive of about 40 minutes. You must also complete one manoeuvre, you will also drive independently for about 10 minutes following a series of directions that you will be shown when you are parked at the side of the road, or you maybe asked to follow road signs (or a combination of both). You may or may not do the emergency stop. 1. Pin up a map of your test centre area and mark out the test routes. Mark difficult areas on it such as one-way streets, difficult junctions, double mini roundabouts, so that you are ready for them on approach, rather than having to deal with them as if they have come out of nowhere. Make sure you get plenty of practice over the test routes with a professional driving school such as Miles Ahead. Driving Test Centres (address & pass rates) and Driving Test Routes in North and East Birmingham are covered by Miles Ahead Driving School. Source: Driving Standards Agency (DSA). As an alternative to a conventional map, you can use Windows Live Maps to locate your test centre; many areas are covered by close-up "bird-eye view" photographs, so you can see every roundabout, pelican crossing and box junction on the surrounding roads. You can mark difficult areas on Live Maps using virtual pushpins. 3. Practise, practise, and practise until you can drive without verbal or physical intervention from your instructor for the duration of a full driving lesson or a mock driving test. Don't forget: it's not practice that makes perfect: it's practice – with a professional driving instructor – that makes perfect. 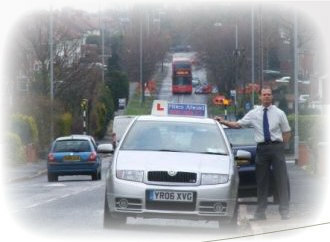 i) Warm up: Arrange to have an hour's driving lesson around the area of the test centre on the day of your test. This will help you to warm up and get into the swing of things. You will also be aware of any new roadworks, obstructions etc and will feel more able to deal with them more easily. Forewarned is forearmed. viii) Have I already failed? If you feel you've made a mistake, don't instantly assume you've failed – it may only have been a minor fault. Put it behind you and carry on driving as well as you can. Do you need more help or advice? Simply contact us and our highly trained driving instructor will answer your questions ASAP. This is just not true. Perhaps this myth originates with those embarrassed by failure trying to come up with a convincing reason for family and friends. If you are up to driving test standard you will pass. It’s not meant to be easy, and the fact is that over 50% of candidates are just not up to the standard required. Driving examiners don’t fail you: you fail yourself. It would be easy to blame a ‘personality clash’ for failure, but again, driving examiners are professionals. Personal feelings or prejudices are irrelevant. An examiner whose work record showed an inclination to fail, for example women or a particular ethnic group, would soon be spotted. We would all like to blame someone else for our mistakes. The only way you will eventually pass is if you take responsibility for your performance and work hard to correct your faults. Talk to the experts at Miles Ahead if you can’t understand why you keep failing. This might seem like a good idea, but in fact it isn’t. The pupils who turn up in their own vehicles are usually those who have had no professional driving tuition, or are so dangerous the driving school has not let them use their vehicle. The examiner will be aware of this from the beginning and it is likely to make him or her nervous. In addition, the car will not have a dual braking system, which may mean the driving examiner might be inclined to intervene, verbally or physically, prematurely. Intervention by the examiner means failure, so you don’t want to increase the chances of that happening by using a car without the dual brake. You have a far better chance of passing if you use our Miles Ahead Driving School car. Stalling happens. If it happens in a dangerous situation, say, on a roundabout, you could be in trouble. If it happens on a normal stretch of road, the important thing is how you deal with it. If it's safe to do so, keep the car rolling and restart the engine with the clutch down on the floor, you can then sort the gear out and if safe, drive on, (do affective observations). only stop if it would be unsafe to continue. (try not to brake harshly). Panicking is not a good idea. Just take a deep breath, start again, and it is unlikely you would be failed on that one thing alone. We certainly don’t at Miles Ahead Driving Lessons Birmingham. It is not in any school’s best interests to have lots of learners taking lesson after lesson with no end result. We want our former pupils to spread the word about their success! We give you advice, and if you want an independent rough guide: you are ready to take your test if you can drive for an hour without the verbal aid or assistance of your instructor. The DSA says that most people fail simply because they take the test before they are ready. The best advice we can give you at Miles Ahead Driving School is: trust the examining system and assume the examiner is a professional. Treat him or her with respect. If you have any issues or problems about a failed test, talk to us at the School and we will investigate if appropriate. Never tackle the examiner directly.